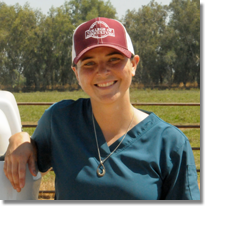 Kate’s passion for ranching also helped achieve her goal of becoming a large animal veterinarian. “I have my own small herd of cows that helped finance my way through college and vet school, which I plan on growing as my practice allows”. Kate’s dedication to her education and career has paid off, but she acknowledges that at times it can be difficult for students to find their place in agriculture. “Be passionate about what you do. There are so many opportunities in agriculture industry so you can find what fits you. Be open minded and don’t get discouraged too quickly”. Kate’s commitment to ranching and livestock production honors Mr. Rustici's legacy, and she is grateful to have been a recipient of the Rustici Livestock and Rangeland Scholarship. “I am extremely grateful to have been a recipient of the Rustici scholarship while at Chico State. It is an amazing opportunity for all students who wish to pursue a career in the beef industry. The financial support provided by the Rustici scholarship made it possible for me to attend veterinary school and become a large animal veterinarian”.